Jonathan Stewart shares his adventures on the Hayduke Trail. 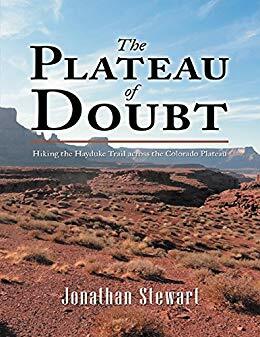 "The Plateau of Doubt" details a 725 mile, two season trek tracing the Hayduke Trail across the Colorado Plateau. Not only does it describe the stunning scenery spanning six national parks, two national forests, three wilderness areas, two national monuments and one national recreation area, but underlines the challenges involved in hiking one of the most remote and desiccated landscapes on earth. It illustrates the dramatic impacts a warming world and over-grazing are having on the fragile environment of the American Southwest. Jonathan Stewart has spent the past decade hiking over 12,000 miles of long distance trails throughout the Americas. This includes hiking the length of the Pacific Crest and Continental Divide Trails as detailed in his two previous books entitled Pilgrimage to the Edge and Walking Away from the Land. He spent three decades working for the U.S. Forest Service where he fought wildfires as a smokejumper, heliattack foreman and crew boss, directed wilderness and back country crews and managed a variety of youth and volunteer programs. He also spent two years as a Peace Corps volunteer in Nepal and six years as director of one of this nation's first AmeriCorps programs. He currently volunteers as a crew leader for the Conservation Volunteers International Program helping rebuild trails in Patagonia while managing his family tree farm in Oregon.